2017 was a down and down year. There were some ups, but they seemed like mere molehills compared to the mammoth valleys that were the downs. Every year I think, "Well, the next year has to be better than this one..." and the next year basically says, "Hold my beer." If I had one quote I would like to send 2017, it would be from Mr. Spock in Star Trek VI. I would say, "Go to hell." The week between Christmas and New Years is the biggest week for e-book sales. So, for all of you that received e-book readers over the holidays, Smashwords is having a massive sale, and we at Nomadic Delirium Press are proud to be a part of it. You can download most of our titles at significant discounts...in some cases, up to 75% off, and we've even made a few titles available for free! Go to https://www.smashwords.com/profile/view/nomadicdelirium, and start downloading and reading today! Now through New Years, Smashwords is having a massive sale on e-book titles. All of my collections are available for 50% off, and I've also made a few of my individual stories available for free that are normally 99 cents. So check out the sale today at https://www.smashwords.com/profile/view/jaerwine. We’re looking for poems about the exploration of space. The poems can be about our solar system, other solar systems, black holes, or anything in between. We publish a lot of fiction about the exploration of space, but now we want the poet’s point of view. All poems must be at least 20 lines in length. While experimental structure is ok for print, this collection will be both print and electronic, and experimental structures do not translate well to electronic formats, so preference will be given to poems with traditional structures. We will accept no more than two poems from each poet, so please send us your best, and we are not looking for reprints for this collection. Payment will be $5 per poem and one contributor’s copy. All submissions should be sent to editor (at) nomadicdeliriumpress (dot) com. The subject should be “Poet Explores submission.” We prefer attachments, but you can paste your submission into the body of the e-mail. If you have any questions, please send them to the address above. You can now get all four 2017 issues of The Fifth Di... for just $6! 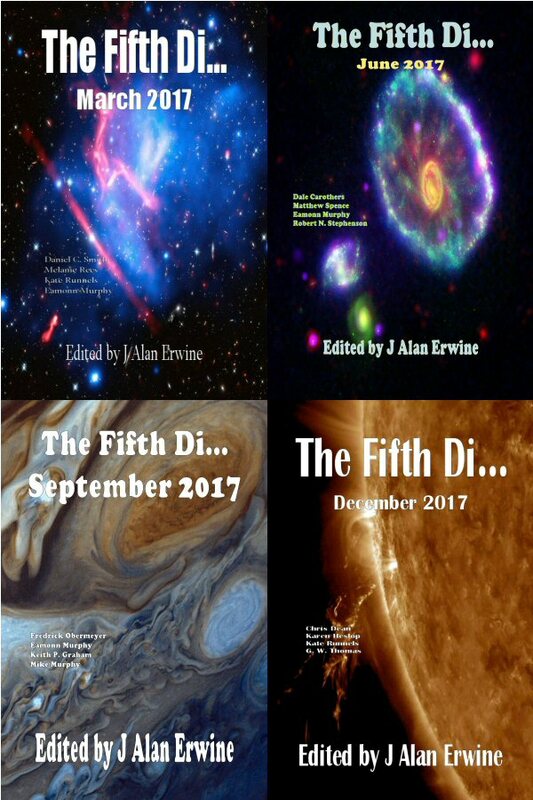 Go to http://nomadicdeliriumpress.com/blog/product/the-fifth-di-2017-bundle/ and download your copies today. Don't worry, if the download doesn't work, we'll e-mail you your copies. In addition, The Fifth Di... is once again open to submissions and The Martian Wave is again looking for poetry submissions. We'd like to introduce you to our newest project...Mars Station Beta. This will be a shared world project, much like The Divided States of America. The year is 2052. It has been two years since the unexplained destruction of Mars Station Alpha, and now the human race has decided to go back to Mars, but on an even more massive scale. Mars Station Beta is made up of ten different modules that are all interconnected with each other and around a central lab/recreation area. There are a total of 50 colonists on the station with another 50 on their way from Earth. The base is a multi-national project, funded by the largest nations on Earth, with representatives from all of those nations, as well as a few of the best and brightest from the “lesser” nations. While nationalism is still an issue, it’s not as big of an issue following the short duration World War III that swept the Earth in 2022. Mars Station Beta has been established in Elysium Plantia. Mars Station Alpha had been established in Argyre Planitia, but so far, no one has visited the station to try to determine what happened to the 20 colonists. All that is known is that their final transmission was, “I can’t believe there are…” Before that transmission, there were no signs of problems with the base. Mars Station Beta is commanded by Roger Anderson, a hard-nosed military man from the United States. While he is a fair leader, he has little patience with the scientists on the base because they don’t have the same type of discipline as the military members. The second in command is Vasili Andropova, a former member of the Russian military, who has now devoted herself to the pursuit of genetic research. She tolerates Commander Anderson, but she has little patience for his sense of discipline. If you’d like to contribute to Mars Station Beta, we’re looking for individual stories of at least 2,500 words. How we will publish: This will not be an anthology (at first). We will be publishing each story as an individual e-story, and these stories will be distributed to all of the usual sales markets. Pay: This will depend entirely on how the story sells. We will be doing a 50/50 split with each author of the profits from the story, with royalties being paid on our normal quarterly schedule. If this project takes off, we will be doing a print anthology, or possibly many print anthologies, and then there will be further payment at that point for reprint rights. Rights: We are looking for first rights on any story. Price of stories: The pricing of stories will depend on their length. Stories from 2,500 words to 5,000 words will be priced at 99 cents. Stories that are 5,001 words to 10,000 words will be priced at $1.49, and stories that are over 10,000 words will be priced at $1.99. Obviously the longer the story, the higher the royalty, but we prefer quality over length. Overall theme: We are not looking for an overall theme to the stories. We want quality stories. Stories should be about characters other than the two commanders. It’s fine to include them as background characters, but we’d like to see stories about the other characters. If you’d like to share character or story ideas with other writers, we can set up a private Facebook group for this project that will allow everyone to throw ideas out and play off of each other’s ideas. What we’re looking for: We want stories about criminal activity in the future. We’re not looking for detective stories…we want stories that are about the criminals themselves, and their activities. This is a science fiction anthology, so science has to play some role in the story. Hard SF would be great, but we will look at adventure SF as well. As important as science is to the story, we really want to see well drawn characters who are believable and act in realistic ways. We all know that crime is a bad thing, but these people do it for a reason…what is that reason? Having said that, we don’t want to see fiction that portrays the criminals as completely evil with no redeeming qualities. Story length: Stories must be 2,000-7,000 words in length. Rights: We would prefer to buy first rights, but we will accept reprints as long as the previous publishing history is included. You also must own the rights to the story. Payment: Now for the important stuff. We will pay ½ cent per word for first rights, plus two contributor copies, paid on publication. We will pay a $5 flat fee plus two contributor copies on publication for reprints. Please make sure you note the difference in pay. What we don’t want: As already stated, no detective stories, no unbelievable characters. We also don’t want to see fan fiction, or fiction based in other people’s universes. If you’ve written a lot of stories in your own universe, then we certainly don’t mind that. Response times: We will respond to all submissions within two months, but we will respond with a form rejection…we just like to let everyone know that up front. Reading Period: We will be reading submissions until the anthology is full. Submission Formats: All submissions must be sent as attachments, no exceptions. Stories should be formatted in Word or rtf. Submission address: To submit a piece, or if you have any further questions, please send them to editor (at) nomadicdeliriumpress (dot) com. Sorry, we aren’t using hyperlinks because we’re really sick of the damn spammers. All submissions should have the subject: Future Syndicate Submission.